We spent several days enjoying the cafes and pubs of Townsville. The Palmer Street restaurant district is just behind the TMBYC marina, and from there it is but a short stroll to the Flinders Street East pub and club circuit. We didn’t have a single bad drink or indifferent meal in Townsville. We became regulars at the Townsville Brewery, situated in the impressive old General Post Office building and home to seven or eight enormously impressive boutique beers, and Cactus Jack’s which offers excellent margaritas in its rooftop bar with views out over the town. The other big draw is The Strand, which is the area backing Townsville’s long beachfront. The town planners have done a marvellous job here in creating something akin to La Rambla in Montevideo and many other latin countries. The beach remains pristine, but is now backed by a wide boulevard dotted with palm trees, sculptures, memorials, and playgrounds for young and old alike. One of these playgrounds is a fountain designed for playing in, complete with water cannons and a big bucket which periodically soaks everybody in the area. The Strand is delightfully uncommercial. Some low-rise hotels sit unobtrusively far back across the road, and the occasional cafes and restaurants are tucked away in secluded corners so as not to detract from the sweep of the bay. Bronwyn’s favourite was Juliette’s, a gelateria that makes its own gelato on the spot and which does cracking business well into the night. As well as the beach itself, sections of which are protected by stinger nets to guard against jellyfish, The Strand also boasts a pool at each end. The Tobruk pool was used for training by Australia’s olympic swimmers in the sixties (the entrance hall alone is well worth a visit for its collection of photos from that period), and the Kissing Point Rock Pool is an artificial swimming lagoon designed to provide safe swimming in the stinger season. 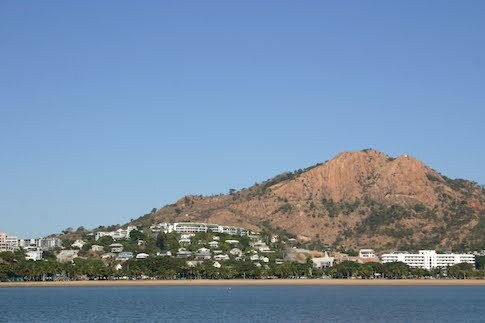 We get the feeling that Townsville is destined for good things. It has not escaped the world’s current financial problems; for instance, the central mall was closed down and scheduled for major prestigious redevelopment, but this project has been put on hold so that a large part of the centre now sits idle and locals have to travel to the suburbs to do their shopping. All around, premium apartments have been built – neither too high nor too offensive, more kudos to the town planners – but we understood that hundreds of them stand empty awaiting buyers who never came. On the other hand, the town’s prosperity was never derived from tourism, and the constant flow of mineral, agricultural and livestock wealth continues to flow from the North Queensland interior to the various loaders and refineries to the south of the town. Day followed perfect day, and we began to think that we would never get around to leaving. It was nice to be stuck somewhere because we wanted to be, instead of – as has happened so often on this trip – being trapped by storms. In the end, though, we realised that if we were going to get around the northern coast of Australia before the advent of the cyclone season, then we needed to get moving. But we really like Townsville, and will return. GOODBYE, TOWNSVILLE. WE’LL BE BACK. This entry was posted in Australia, Oceania, Travel, Voyage of Pindimara and tagged Sail, Townsville on 2009/08/07 by Reinhard.